В конце 1915 года инженеры лейпцигской фирмы Дойче Флюгцойгверк (DFW) разработали проект тяжелого четырехмоторного бомбардировщика под заводским обозначением T26. Поскольку отработанной схемы подобных машин еще не существовало, каждая фирма, рискнувшая взяться за столь сложный проект, шла своим путем, действуя методом проб и ошибок. Конструкторы DFW решили разместить все четыре мотора своего аэроплана внутри объемного фюзеляжа между крыльями. Каждый двигатель работал на один винт, будучи связан с ним посредством конических передач и длинных валов. По авторскому замыслу такая схема позволяла снизить лобовое сопротивление и давала возможность обслуживать в полете весьма капризные и ненадежные тогдашние моторы. Но потери мощности в передаточных механизмах были весьма велики, а значительная масса этих устройств чрезмерно утяжеляла машину. Тем не менее, 5 сентября 1916 года T26 совершил успешный четырехчасовой полет, доказав, что при тщательной проработке даже не вполне удачная конструкция может оказаться жизнеспособной. В дальнейшем самолет продемонстрировал возможность нормально летать на трех моторах. В октябре он был принят на вооружение, однако новых заказов не последовало. Первый летающий гигант фирмы DFW остался в единственном экземпляре. Военные присвоили машине индекс R-I (R - от слова Riesenflugzeuge, буквально - "огромный самолет"). DFW R-I - цельнодеревянный трехстоечный биплан. Фюзеляж обшит фанерой, крылья и оперение - полотном. Экипаж - 5 человек: штурман-бомбардир, он же носовой стрелок, два пилота, механик-моторист и хвостовой стрелок. Два тянущих винта располагались у передней кромки верхнего крыла, а два толкающих - у задней кромки нижнего. Ранней весной 1917-го DFW R-I прибыл на русско-германский фронт, но вскоре, так и не сделав ни одного вылета, был отправлен на фирму для доработки трансмиссии. В начале лета он вновь появился на восточном фронте и 13 июня совершил с аэродрома Альт-Ауц налет на Ригу, сбросив 680 кг бомб. Во время второго боевого вылета на самолете один за другим отказали два двигателя. При вынужденной посадке DFW угодил колесами в траншею и развалился на куски. Между тем, фирма DFW в 1917 году построила второй вариант бомбардировщика, аппарат значительно более крупных размеров и с моторами увеличенной мощности. Его летные данные были признаны недостаточными для фронтового применения. Самолет, названный DFW R-II, отправили в учебную часть под Кёльном. В следующем году появился очередной прототип (серийное обозначение - R11/16), который также не попал на фронт и служил в качестве учебной машины. Интересной особенностью этого самолета был агрегат турбонаддува, приводимый в действие пятым мотором и предназначенный для повышения высотности четырех основных двигателей. В 1930-е годы подобными установками оснащались советские тяжелые бомбардировщики Пе-8. Носовая и хвостовая турели, а также нижняя люковая установка с пулеметами "Парабеллум", до 800 кг бомб. Serialled R 11/15, work was begun on the R I in September 1915, and acceptance trials began in October 1916. After initial trouble with crankshaft failure, strengthened bearers and transmission shafts were fitted. Later the aircraft was sent to the Eastern Front, where it was usefully employed from 30th April 1917. Engines, four 220 h.p. Mercedes D IV, mounted inside fuselage driving two tractor and two pusher airscrews through transmission gear and bevel gears. Span, 29.5 m. (96 ft. 9 5/8 in. ), length, 17.6 m. (57 ft. 9 in.). Area, 185 sq.m. (1,998 sq.ft.). Weights: Empty, 5,652 kg. (12,434 lb.). Loaded, 8,382 kg. (18,440 lb.). Speed, 130 km.hr. (81.25 m.p.h.). Climb, 1,000 m. (3,280 ft.) in 10 min., 3,300 m. (10,826 ft.) in 53 min. Duration, 6 hr. On the eventual success of the R I, six larger versions were ordered, but only two (R 15/16 and R 16/16) had been completed before the end of the war. Transmission trouble, with shafts geared up to 3,000 r.p.m., was experienced until strengthened cases and improved bearings were fitted. Reduction gears brought down airscrew speed to 900 r.p.m. The R II number R 15 is illustrated. Engines, four 260 h.p. Mercedes D IVa mounted inside fuselage driving two tractor and two pusher airscrews. Span, 35 0 m. (114 ft. 10 1/8 in.). Length, 210 m. (68 ft. 10 7/8 in.). Height, 6.5 m. (21 ft. 4 in.). Area, 364 sq.m. (3,931.2 sq.ft.). Weights: Empty, 8,600 kg. (18,920 lb.). Loaded, 12,460 kg. (27,412 lb.). Speed, 132 km.hr. (82.5 m.p.h.). Duration, 6 hr. The Deutsche Flugzeugwerke was founded in 1911 at Lindenthal near Leipzig, and prior to the war produced many successful aircraft, such as the "Mars" biplane and the "Stahl-Taube". One of the former was purchased by the Royal Naval Air Service in 1914. During the war DFW was a chief supplier of C-type aircraft to the German Army Air Service, in particular, the sturdy DFW C.V. In 1915, at the request of Idflieg, DFW joined the R-plane programme, and its contribution was a series of clean, carefully engineered aircraft noted primarily for the successful application of a simple and straightforward solution for transmitting power from internally-mounted engines to propellers. The DFW R.I was designed by Hermann Dorner (who in October 1916 left DFW to take the position of chief engineer at the Hannoversche Waggonfabrik, where he built the well-known Hannover two-seat fighters). Heinrich Oelerich, a renowned pre-war pilot, assisted Dorner in the design of the DFW R-planes and as technical director, he was responsible for supervising the development of the R.II series. Help was also given by Prof. H. Reissner as consultant, Dipl.Ing. Sander was the lead engineer and Oblt. Bruckmann, Denicke and Steinbeck were the test pilots. The construction of the DFW R.I 11/15 (company designation T 26) began on 1 September 1915, and was completed about a year later. The comparatively long construction period was due to a number of factors. DFW was specifically asked by Idflieg to utilize plywood for the fuselage covering, and application of this material to large curved surfaces was obviously a time-consuming process. Furthermore, the DFW R.I and its successors were carefully engineered and showed signs of craftsmanship throughout. Finally, the effort expanded in starting production of the promising DFW C.V. observation aircraft to replace ageing Albatros, Rumpler and AEG C-types probably sapped much of the labour and materials from the R.I programme. The R.I and later DFW giants were unique in that they were the only aircraft which had internally-mounted engines each driving a separate propeller. The four 220 h.p. Mercedes D.IV engines were arranged in the following manner: the forward pair of engines was mounted above and slightly ahead of the rear engines. Each forward engine was connected to a transmission shaft which ran at an angle from the fuselage to a streamlined right-angle propeller gear-box that was attached to the inner struts just below the upper wing. Similarly, the rear engine each drove a pusher propeller mounted near the trailing edge of the lower wing. Each engine was equipped with a gear-box and clutch. The assembly formed four self-contained units completely independent of each other. The advantage of this system was that it eliminated the massive and complicated clutch-gear assemblies necessary to transfer power of three or four engines to a common drive shaft, and yet it retained all the desirable features of enclosed engines. This system proved to be efficient and mechanically sound in the long run, although it was many months before all the "bugs" were completely eliminated. The engines were cooled initially by triangular radiators fitted between the centre-section struts. These were soon replaced by four Windhoff radiators positioned around the fuselage in the centre section gap. They were of standard pattern, very similar to those used on DFW C-types and fitted with shutters. The construction of the R.I differed only in detail from that of the larger and better known R.II. The three-bay wooden wings were fabric covered, of equal chord throughout and had washed-out wing tips. 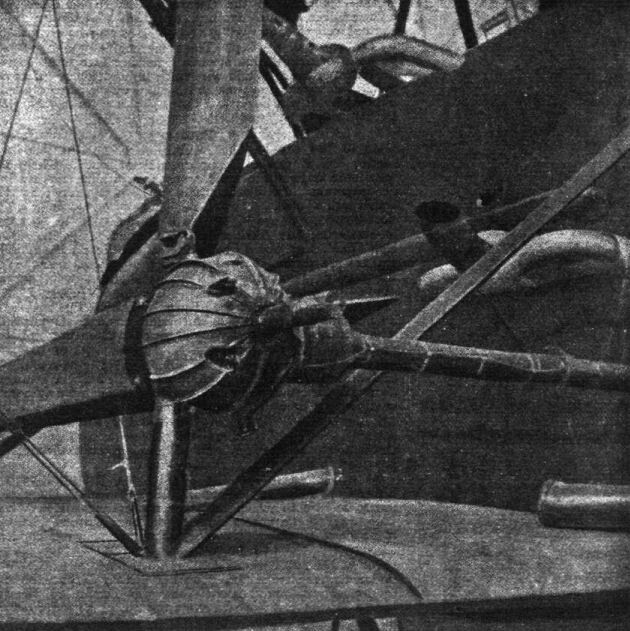 Unbalanced ailerons were fitted to the upper wings only. The centre fuselage decking of the R.I had a markedly humped appearance because the rear decking was cut down to provide a better field of fire to the rear. A noticeable feature of both the R.I and R.II was the large semi-external gravity tank located just forward of the dorsal-gun position. Initially the biplane tail did not have a central fin, but one was added at a later date. The tailplanes differed from those on the R.II in that they were triangular in form. 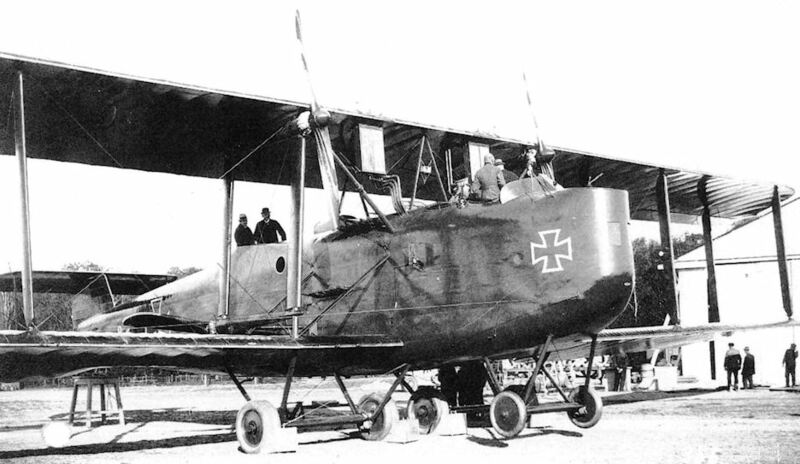 The R.I made its maiden flight on 5 September 1916, and after twelve factory flights (of 8 hours total duration) it was delivered from Grosszschocher to the Army air park at Doberitz, where on 19 October 1916 it successfully completed a 2 1/2 hour military acceptance flight. During further trials at Doberitz a number of crankshaft failures occurred, more than could be properly attributed to faulty construction or poor materials of the engine. There is no doubt that the excessively long crank-shaft required by the eight in-line cylinders of the Mercedes D.IV was very sensitive to vibration, and furthermore the Mercedes D.IV was never a very successful engine. Engineers traced the failures to the high frequency vibrations, which in turn could be traced to the light and poorly reinforced engine mounts. These were replaced by greatly strengthened mounts, while universal joints and other vibration reducing devices were installed in the drive system. The span was increased slightly, requiring the addition of an extra rear strut between the wing tips. These modifications were completed by March 1917. The R.I was now ready for operational testing, and on 30 April it was flown from Doberitz via Konigsberg to Alt-Auz, where Rfa 500 was stationed. Test flights were carried out during which it was found that the R.I could fly on two engines provided the speed was kept high and the aircraft was in light condition. At low speed with forward propellers disengaged the R.I had a tendency to stall. Three-engined flight was feasible only as long as the rudders were adjusted to counter the unequal thrust. The R.II was returned to DFW for repairs and delivered anew in May 1917. The one and only bombing mission flown by the R.I was on 13 June 1917 when it dropped 680 kg. bombs on Schlok in retaliation for an earlier Russian attack. It carried a crew of five: two pilots, two observers and one machinist. The career of the R.I ended in September 1917. It had taken off on a bombing mission when one of it engines failed and the commander decided to return to base rather than continue on three engines. On the return flight a gear-box began to overheat badly, and a second engine had to be stopped. It was impossible to keep the heavily-loaded aircraft in the air on two engines, so the decision was made to land on a nearby artillery training field. The R.I made a good landing in spite of ground fog, but during the landing run the wheels rolled into an unseen practice trench. The aircraft broke up, and upper fuel tanks spilled petrol on to the one remaining running engine. Shortly after the crew had left the aircraft it burst into fire and the bombs exploded. One crew member, whose petrol-soaked clothes caught fire, perished. Initially the R.I was painted a light colour overall with black Patee crosses painted directly on wingtips, fuselage and rudders. The final version sported a two-tone camouflage on the upper areas of wings and tail and on the sides and top of the fuselage. All underneath surfaces were painted a light colour. National markings consisted of the black cross Patee on a white square background, painted on the wingtips, fuselage and rudders. The serial number R.II was painted in black on the extreme front of the nose. Prop Revs: 900 r.p.m. 900 r.p.m. Span 29.5 m. (96 ft. 9 in.) 30.5 m. (100 ft.) approx. Flight tests had demonstrated that the R.I was endowed with adequate climb and manoeuvrability, and on this basis Idflieg placed an order on 13 November 1916 for six improved versions having a greater payload. The construction of these improved machines, designated R.II and numbered R.15/16 to R.20/16 (company designation T 26 II) was started on 10 December 1916 and differed from the R.I primarily in that the overall size was increased. The general impression is that of a simple well-designed, if somewhat bulky aircraft. The layout of the engines and the transmission system remained basically the same. The engine mountings were built of pressed steel and integral with the fuselage frames, forming a strong, compact centre-section structure which also supported wings, propeller mounts, landing gear and centre-section struts. Furthermore, the fuel tanks and bomb bay were located within this structure, thereby concentrating the stresses in a comparatively small but heavily reinforced frame-work. Power was provided by four 260 h.p. Mercedes D.IVa engines which were coupled individually to the four propellers by bevel gears and carden shafts. Electric thermocouples allowed the pilots and flight-engineer to keep an eye on the running temperatures of gears and bearings. Cooling for the engines was by two large slab-shaped radiators, built by NFW, in the wing gap, above and to each side of the fuselage. Six fuel tanks, each of 350 litres capacity, re ted on frames below the engines, and a gravity tank of equal capacity was fitted semi-externally on the fuselage decking. The robust fuselage consisted of four wooden main longerons spaced by wooden bulkheads and reinforced by steel tube frames and cables. The floors and catwalks were an integral part of the fuselage structure and added to its stiffness. Twisting forces were a serious problem with the long fabric-covered fuselages of the early Staaken types, but the DFW R-planes with their doped fabric-covered plywood fuselages had no difficulty in this respect. The internal layout was conventional, consisting of a nose machine-gun position, followed by a spacious cockpit for the two pilots, and a separate commandant's cockpit to the rear on the starboard side. Beneath the cockpit was the usual wireless station followed by a passageway leading through the engine-room, the roof of which was fitted with windows that could be tilted up to provide extra ventilation. Farther aft were the dorsal and ventral machine-gun positions. The three bay wings were constructed of wood and braced internally with steel compression tubes and double cables. Interplane struts were faired steel tubes, and all wing bracing was double cable. The lower wings incorporated dihedral and were cut away at their trailing edges to clear the pusher propellers. Balanced ailerons were fitted to the upper planes only. The empennage consisted of a biplane tail; the central fin and lower tailplane were an integral part of the fuselage and both tailplanes were fitted with elevators. The king posts of the outboard rudders doubled as rear tail struts. All tail control surfaces were balanced. The first R.II (R.15) made its maiden flight on 17 September 1917 successfully in all respects save one; serious vibrations were still very much in evidence in spite of greatly strengthened engine mounts. The problem lay in the high revolutions of the outrigger transmission shafts, and this was solved by encasing the shafts within stiffener tubes with the help of ball-race. In March 1918 Sabersky-Mussgbrodt returned to DFW (which he had left in 1916 for LVG) and became the chief engineer of the R-plane section. On 1 April 1918 the R.15 was delivered to the Riesenflugzeugersatzabteilung (Rea: R-plane Support Section) in Cologne. The protracted development period of the DFW R-planes delayed their introduction into operational service; by then the Staaken types had surpassed them in performance, reliability and load-carrying ability. Not one R.II ever saw active service; rather they were relegated to training air crews and performing experimental work. Sometime in 1918 the R.15 had a serious crash in which Oelerich was crippled for life. 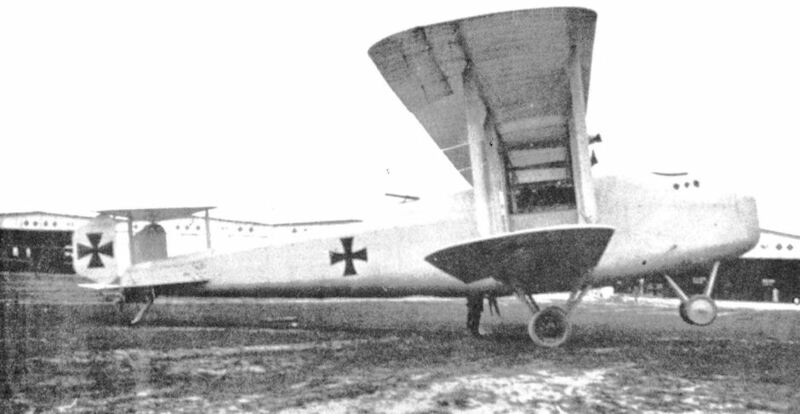 The second R.II (R 16/16) was completed in February 1918; its performance was disappointing, and in April modifications were proposed in order to improve it. These included a lighter wing of increased size, removal of the nose landing-gear and relocation of the main undercarriage 80 cm. forward. The advisability of strengthening the fuselage was to be determined by static-testing one of the completed unit. Not all these modification were made; however, the proposal to install a supercharger was accepted. The report concludes with, "Only after full flight tests with the R.16, will the remaining four aircraft be completed." On 21 May 1918 the R.16 was flown from Lindenthal to Grosszschocher for installation of the Brown-Boveri turbo supercharger driven by a 120 h.p. Mercedes D.II. Ground tests of the supercharger were conducted without a hitch, and the first test flight of the supercharged R.16 took place on 22 July 1918. The supercharger supplied compressed air directly to the intake manifolds. The conduits for this passed along the outside of the fuselage. A small radiator was attached by bracket to the starboard side of the fuselage to provide cooling for the Mercedes engine. Other alterations included the fitting of exhaust collector manifolds, strengthening of the tractor propeller housings and fitting of a ramp for the ventral-gun position. Early flight test with the R.15 had shown that the aircraft was sluggish, so a third rudder was added to the central fin of the R.16 to improve manoeuvrability. Although ordered in 1916, the serial number of the R.16/16 was changed to R.16/17, reflecting perhaps the shift of the R.16 programme to the 1917 budget. The R.16 was ready for operational service in October 1918. By the war's end three of the six R.II machines ordered had been completed, the last being the R.17 which made its first flight on 22 July 1918. It has been claimed that the R.16 and R.17 were delivered to Rea in Cologne. The R.18 and R.19 were almost completed at the time of the Armistice, and Idflieg cancelled the R.20 due to the poor showing of its predecessors. In December 1918 the R.15 and R.17 were standing in the open along with other Rfa 500 and Rfa 501 aircraft at Dusseldorf-Lohausen. Waldemar Roeder remembers his attempt to fly the R.15 to Kassel away from the danger zone on 24 December 1918, the last day it was allowed. Since all the technical personnel had dispersed, the crew consisted of five R-plane pilots. At first the weather was good, but in the Ruhr Roeder had to descend. When he gave full throttle again both port engines failed, and he was forced to land near Soest in Westphalia. In 1920, the R.15 was inspected by an Inter-Allied Control Commission team at Doberitz. The Inter-Allied Control Commission found three R.II machines in the DFW hangar at Grosszschocher (near Leipzig) in 1919. 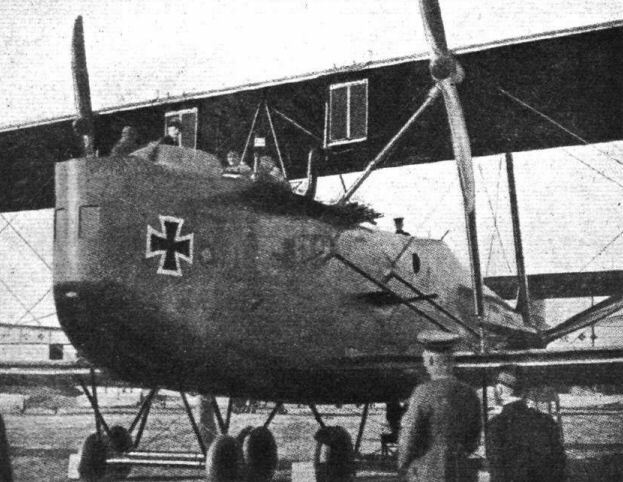 In April 1919 an R.II was sent to Cologne to perform extensive test for the Allies. This aircraft was most probably the supercharged R.16. 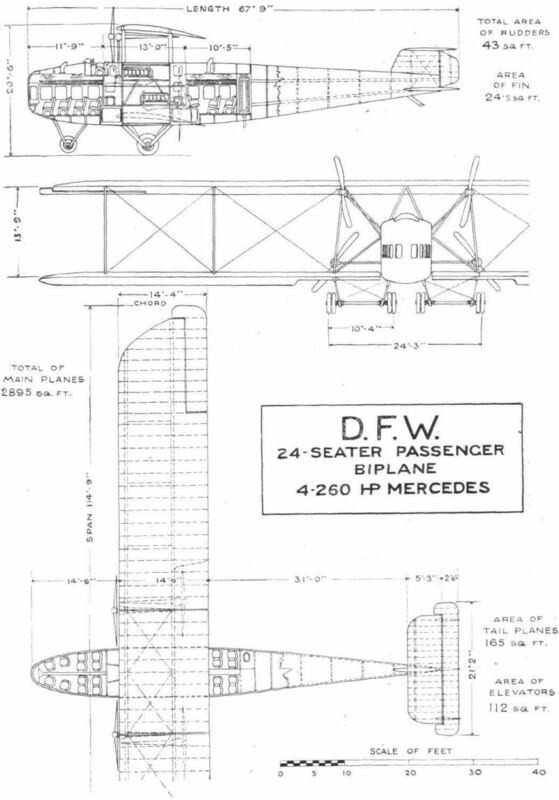 After the War DFW received permission and funds to complete the unfinished R.18 and R.19 as civil aircraft, and DFW planned to complete these as the F.26 twenty-four passenger transport. The F.26 was to have had two cabins separated by the engines, each seating twelve passengers, including ample space for luggage and sanitary arrangements. However, nothing came of the plan and the machines were scrapped. The overall finish consisted of a two-tone camouflage pattern applied to the upper areas of wings, tail and on the sides and top of the fuselage. All underneath surfaces were painted a light colour. The R.15 carried the Patee crosses thinly edged in white. The R.16 had the late 1918 style Latin crosses spanning the full chord of the wings and rudders. The serial numbers were painted in white on both sides of the rear fuselage. Climb, 2000 m. (6562 ft.) in 58 mins. Engine and supercharger, 1155 kg. Loaded, 12,642 kg. (27,875 lb.). Because of the R.II's low performance, DFW already had a more powerful weapon on the drawing boards known as the R.III. 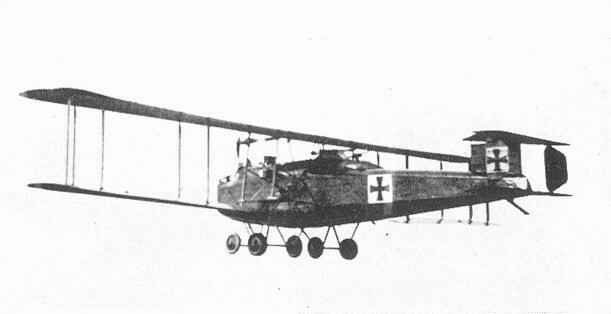 Idflieg ordered two on 3 September 1918. The design work, under the direction of Dipl.-Ing. Willy Sabersky-Mussigbrodt was well advanced at the time of the Armistice. The DFW R.III project was a direct progression of the R.II and similar in many respects except size. The initial proposal called for eight 260 h.p. Mercedes D.IVa engines, each separately connected to eight counter-rotating propellers arranged in a paired tractor and pusher configuration. Exhaustive tests were completed to investigate the efficiency of this combination. Another proposal had four airscrews each driven by two engines coupled through the transmission shaft. The propeller gear-boxes were enclosed in a patented wing-mounted nacelle which also contained the fuel tanks. One (or two) superchargers, each driven by a 120 h.p. engine, maintained performance to 5000 metres. It has been stated that these engines were also to have been used to start the main engines. An unusual feature which was included at the request of Idflieg was the separate navigator's steering station placed well ahead of the wings, whereas the dual cockpit was located directly under the trailing edge of the wings. The navigator could make only small corrections in course with his auxiliary rudder control, but this was considered a very useful feature during the critical landing manoeuvre and bombing-run approach. The massive, double-decked fuselage was of sufficient size to hold 2500 kg. of bombs as well as eight machine-guns, sleeping bunks, wireless station, bomb aimer's post and navigator's cabin. Contrary to the biplane tail units employed on earlier DFW giants, the R.III was to have had a single tailplane mounted on top of the fin and rudder. In place of the tail skid a neatly-faired tail wheel was to have been installed. The serial number (if any) allocated to the R.III is not known. IN spite of the handicaps caused by the Peace conditions, German aircraft firms are losing no time in getting going on their post-War commercial aeroplanes. Since the conclusion of hostilities several firms have commenced the construction of large multi-engined passenger carriers. Among these is the D.F.W. firm (Deutsche Flugzeug Werke), who have nearing completion a large four-engined biplane, designed to carry 24 passengers. This machine is a development of the military type built during the War, and before commencing a description of the commercial machine a brief reference to its prototypes may be of interest. It was in September, 1915, that the D.F.W. works commenced the construction of their first multi-engined type, the R I. This machine was fitted with four 220 h.p. Mercedes engines placed in the fuselage and driving airscrews on the wings by means of bevel gears and shafts. The four engines were arranged inside the fuselage, two on each side, one above the other, leaving a central gangway between them. Under the floor-boards, in front of and behind the engines, the tanks were placed, three in front and three behind. The amount of fuel carried was sufficient for a flight of six hours' duration. Each engine was provided with a transmission drive to airscrews placed on the wings, and the screws were geared down to run at 900 r.p.m. Generally speaking, the power plant was so arranged that each engine, with its transmission-drive and propeller, formed a complete unit which functioned quite independently of the other three. The trial flights are said to have taken place without any breakdowns occurring, and after a total of eight hours in the air the machine was considered ready for her acceptance tests, which took place on October 19, 1916. When weighed for this test the weight of the machine empty was found to be 6,800 kg. (15,000 lbs. ), and the various loads required by the military authorities amounted to 2,600 kg. (5,700 lbs. ), bringing the total weight in flying trim up to 9,400 kg. (20,700 lbs.). The wing loading worked out at about 10.3 lbs./sq. ft., and the power loading at 23.5 lbs./h.p. With this loading the performance during the acceptance tests was as follows: 3,300 ft. in 10 mins. ; 6, 600 ft. in 25 mins. ; and 10,900 ft. in 53 mins. The maximum speed attained was 130 km. (78 miles) per hour. After a flight of 2 1/2 hours' duration the machine landed without mishap at Doberitz. During further test flights at Doberitz # after the machine had been taken over by the Flying Service # trouble was experienced with the crankshafts, which continued to break. This was put down to the excessive length of the eight-cylindered engines, and also to faulty engine mountings. These were re-designed, and the transmission shafts were provided with universal joints. These alterations were completed in March, 1917, and towards the end of that month a trial flight of two hours' duration was made, during which no trouble was experienced. On April 30, 1917, the machine was flown across to the Eastern Front, the trip to Konigsberg being made in 3 hours 55 mins. The experience gained with this type was so satisfactory that the D.F.W. works received an order for six more, these, however, to be fitted with four 260 h.p. Mercedes engines, and to be able to carry a useful load of 3,400 kg. (7,500 lbs.) instead of the useful load of 5,700 lbs. carried by the first machine. The fitting of larger engines, and the demand for a higher useful load, necessarily resulted in a somewhat larger machine. This became known as the Type R II, the first of which was commenced in the early part of 1918. The transmission system was, generally speaking, similar to that of the R I. The first of the R II machines made its first trial flight towards the end of August, 1918. Again transmission troubles developed, and the transmission shafts, which ran at 3,000 r.p.m., showed excessive vibration. In order to stop this the shafts were enclosed in tubes, which arrangement appears to have had the desired effect, as no more transmission trouble was, it is said, experienced. The weight empty of the R II was 8,600 kg. (18,900 lbs. ), and the total loaded weight somewhere about 12,000 kg. (26,500 lbs.). The power load was 25.25 lbs./h.p., and the wing loading 9 lbs./sq. ft.
Before describing the 24-seater passenger machine, it might be mentioned that the D.F.W. firm had the drawings ready for a giant war machine, a side elevation of which is shown in the accompanying illustration. With the signing of Peace this machine was not required, and was, therefore, never built. It is nevertheless of interest in showing the ambitious designs which were entertained by the Germans towards the end of the War. This machine, which, had it materialised, would have been the largest aeroplane in the world # according to the Germans # was to be fitted with eight engines, each of 270 h.p., or a total of 2,160 h.p. The engines were to be started by a compressed air starter operated by an engine of 120 h.p. The same engine would probably be used for driving the electric generator furnishing current for lighting, heating, and wireless. In addition to an armament of eight machine-guns, the machine was to carry 5,500 lbs. of bombs. It will be noticed that in spite of its size the giant D.F.W. was to be fitted with a monoplane tail. As in the case of the military machine, the passenger carrier has a fuselage built entirely of wood. There are four main longerons, to which transverse formers are attached at intervals. In places there are incorporated in the construction steel tube struts and wire bracing. The floor-boards, gangways, etc., are so designed as to assist in rendering the fuselage structure rigid. Special attention has been paid to the engine installation. The engines are mounted on a structure of pressed steel inside the fuselage, two on each side, one slightly ahead of and above the other. The points where the members of this pressed steel framework are secured to the fuselage also serve as attachments for wings and undercarriage struts. The whole fuselage is covered with plywood. The front and rear portions of the body provide accommodation for the passengers, while the central portion is the engine-room. In each of the passenger cabins there are twelve seats, so arranged as to give the occupants a good view out through the numerous windows with which the cabins are provided. Electric lighting and heating are provided, and a wireless outfit is carried. Fire extinguishers are placed at suitable points throughout the fuselage, and all modern conveniences are provided. 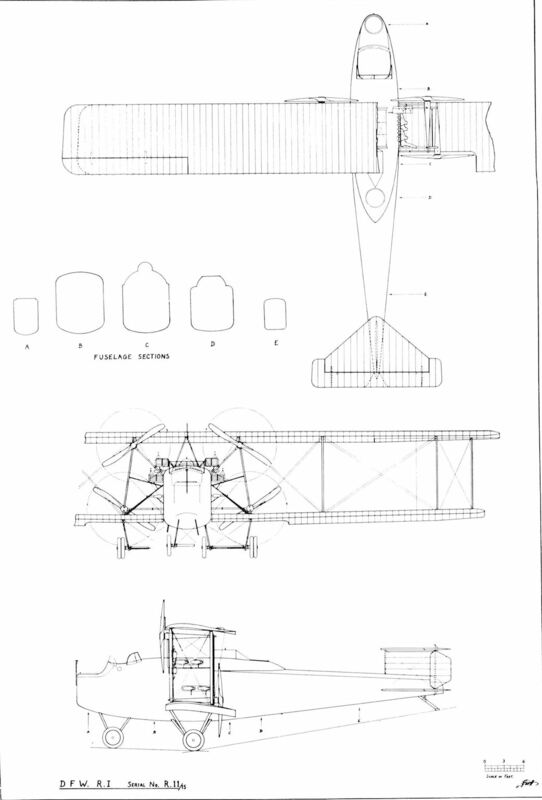 As will be seen from the illustrations, the machine is a biplane, with its top plane in three sections. There is a centre section to which the two end sections are attached. The lower plane consists really of four sections, the two inner ones of which, however, remain in place. The end sections are joined to the two short wing roots of the bottom plane at the point where occur the attachments of the outer undercarriage struts and propeller struts. When the end sections of top and bottom planes are dismantled, the top centre section and the two short bottom plane roots remain in place, with their strutting, propeller drives, etc. The wing construction is of more or less standard form, with spars and ribs of wood, built-up sections being glued with waterproof glue. The wing bracing is in the form of duplicate steel cables. Ailerons are fitted to the top plane only. The tail, it will be seen, is of the biplane type. The vertical fin is built integral with the fuselage and is covered with ply-wood. The two tail planes are attached to the fin and to the fuselage respectively. The bracing is by struts and cables as in the case of the main planes. The elevators are mounted on ball bearings at the rear edge of the tail planes, and the rudders are attached to the rear inter-tail plane struts. The elevator and rudder control cables pass inside the body through suitable guides, while the aileron cables pass over pulleys in the lower plane, and hence to the controls. The arrangement of the undercarriage will be understood from an inspection of the general arrangement drawings. There is an undercarriage on each side, consisting of two Vees of streamline steel tubes, the inner one of which is attached to the fuselage, while the outer one is bolted to the bottom plane. The two Vees are braced diagonally by steel cables. The axles are of chrome nickel steel, slung from the apices of the Vees by rubber cord, and rest in a slot in a plywood fairing. In order to prevent the machine from turning on its nose on landing, a front undercarriage is fitted towards the nose of the fuselage. A swivelling tail skid is mounted direct in the rear part of the body. As already mentioned, the motors are placed inside the fuselage, above one another, and it is said that as a result of keeping the whole central portion of body and wings a complete unit, this part of the structure is very rigid, and that as a consequence no transmission troubles are experienced. As will be seen from the side elevation, the upper engines have their gear end facing forward, while the lower engines are placed the reverse way. The two front engines drive airscrews placed on the front spars of the top plane, while the lower engines drive pushers situated near the rear spars of the lower plane. Consequently the engine shafts and propeller shafts are parallel with one another, and the drive is by sloping shafts and bevel gears. The size of the bevel gears is so proportioned that a gear reduction of 14 to 9 is obtained. That is to say, when the engines are making 1,400 r.p.m. the airscrews are revolving at 900 r.p.m. is claimed that by placing the tractors high and the pushers low as indicated, both are working in undisturbed air, and that this fact, in conjunction with the slow running of the airscrews' 900 r.p.m., makes for very high airscrew efficiency. It is also claimed that in case of one engine cutting out the trim can be maintained by use of rudder and elevators. As the distance between airscrews is fairly great, this claim might be open to doubt. It is said that the machine will fly comfortably with only two engines running, and while this is probably true as regards the actual power, it may be doubted in view of the points of application of the power. In other words, if the trim of the machine is right with all engines working, it is doubtful whether it would be with, for instance, only the tractors pulling, as the centre of thrust would be in that case very much too high. As naturally the transmission bearings are subject to considerable loads, it is important to be in a position to know always what is their condition. To this end all the bearings in the transmission system are provided with electric thermometers which indicate at any time the temperature of each bearing. There are seven petrol tanks placed in the body, each holding 350 litres. DFW R-I (11/15), 500 авиаотряд самолетов-гигантов ВВС Германии, 1917г. The DFW R.I 11/15 in its original form without supplementary wing-tip struts, and fitted with triangular radiators. DFW R.I 11/15. This photograph shows the first form of the tail unit with no fixed vertical surfaces. DFW R. I 11/15, with Windhoff radiators mounted on the fuselage sides. The DFW R.I 11/15 in its final form. The machine in the foreground is a SSW D.1 fighter. The DFW R.I 11/15, which saw service with Rfa 500 on the Eastern Front. DFW R.l 11/15. Note ventral machine-gun and large gravity fuel tank not fitted to the early version. Журнал - Flight за 1919 г. The D.F.W. Military Type R II. : View of the nose of the fuselage, showing transmission shafts, etc. DFW R.Il 16/17. This was the supercharged model and the ducts carrying the supercharged air to the engines can be seen on the outside of the fuselage. THE D.F.W. MILITARY TYPE R II: Three-quarter front view. The D.F.W. Military Type R II. : The port pusher airscrew shaft, above the rear spar of the bottom plane. 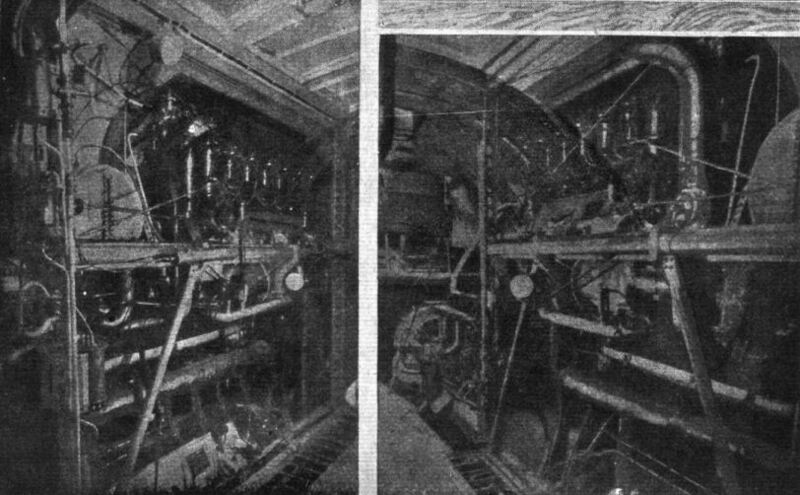 TWO VIEWS OF THE ENGINE-ROOM OF THE D.F.W. MILITARY TYPE R II. Left: The port engine installation. Right: The starboard engines. 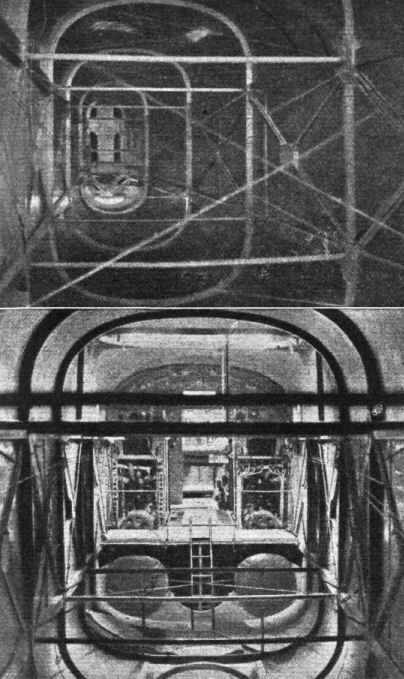 Two views of the interior of the D.F.W. Military Type R II. : Top: Looking aft from the engine-room. Bottom: Looking forward through the engine-room to the pilot's cockpit. The End! 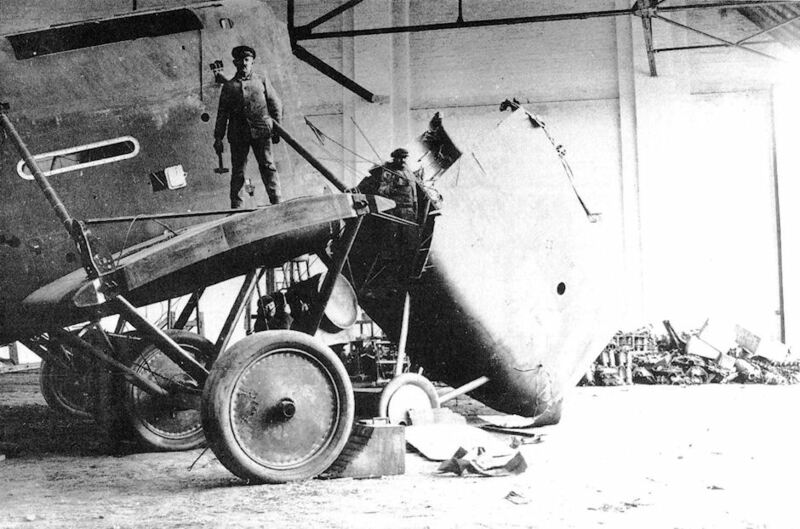 Photographed in 1920, a DFW R.II in the process of being destroyed in accordance with the Treaty of Versailles. 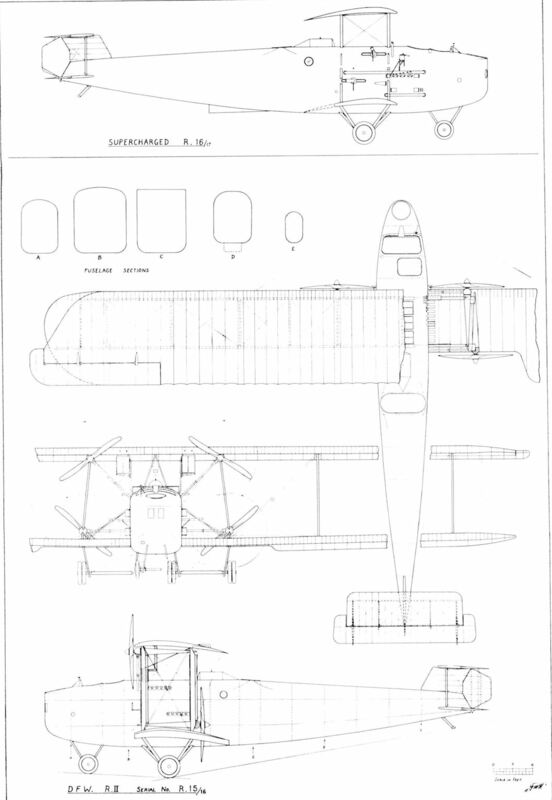 Internal arrangement of the DFW R.III project. A D.F.W. design for a giant aeroplane to be driven by eight engines, each of 270 h.p. Owing to the finish of the War this machine was never built. THE D.F.W. PASSENGER CARRIER: Plan, side and front elevations, to scale.